The satellites are organised into 6 orbital planes with 11 satellites per plane. This ensures that each location on the globe is covered by at least one satellite at any one time. The satellites spin around the earth at over 26,000 km/h or circle the earth every 1000 minutes and the orbital planes go over the poles. 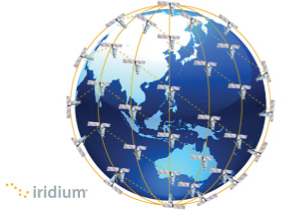 Each satellite is connected to four other satellites in the network. The two adjacent satellites in the same place and two satellites in the planes either side. Through this cross-linking the satellites can route data from satellite to satellite until it reaches one in view of the ground gateway. The ground gateway then sends the data to the Pivotel network, then this is repeated to DigiCore Australia’s servers for processing. This entry was posted in FAQ, Hardware, Jargon and tagged DigiCore Australia, Iridium, IVMS, Satellite Tracking. Bookmark the permalink. ← What does IVMS mean?